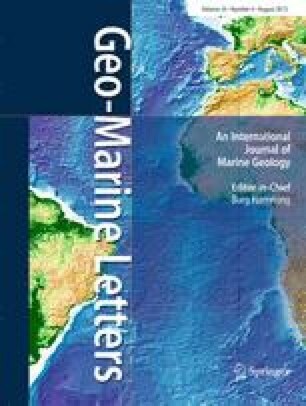 Sedimentary carbon systematics on the Amazon continental shelf were investigated using14C andδ13C measurements of sedimentary organic materials. Mass balance calculations indicate that the14C content of modern shelf muds results from burial of old (~ 5000 yr BP) terrestrial soil carbon and bomb-14C-enriched marine carbon, implying that most of the bomb-labeled riverine particulate carbon is not buried on the shelf. The14C signature of Amazon shelf deposits records the effects of both biogeochemical and sedimentary processes active in this dynamic environment.